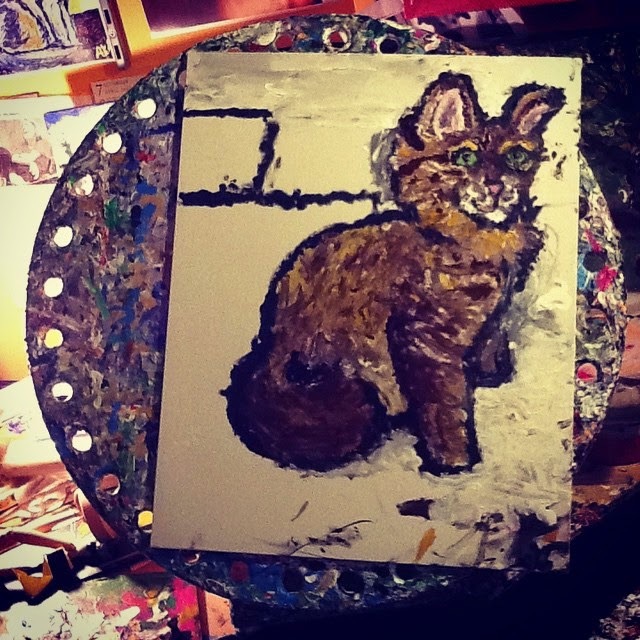 I'm almost finished the painting of the fluffy cat. That's good! Actually, the whole day has been very good and positive. I mean, sure, I woke up feeling extremely depressed like I've been doing for over a month, but talking to my counsellor and getting it all out made me feel better. I think what really made me happy, though, was the reaction of my counsellor to my announcement was that I wanted to try doing mushrooms during the Christmas holidays. I explained to her that I had heard shrooms were very helpful in very helpful in dealing with grief. Much to my amazement, she was very cool and supportive about my idea. I think I would have felt very different and disappointed in my counsellor if she had reacted negatively. In previous posts I've said how I always try to expose myself to the very core, whether in my art or blog. And recently I've been slacking off at least with my blog, either because of time restrictions or because the emotions are too tangled for me to relay here. However, in the future I will try to be more open about what's going on in my head. Right now, though, I am going to try to finish my cat painting.